Today we have an update from our astronomer friend on Comet Elenin. Before I get to that, let me just reassure folks that there is NOT going to be a pole shift in the next week or so as certain raving nutzoids have been spamming all over the net. Also, Comet Elenin is NOT going to hit Earth (which is not to say that other things won’t at some point in space and time). However, there are a few things about this comet that are extremely interesting in view of the plasma comet theory of James McCanney. Again, I suggest that readers get a copy of this book and get up to speed on this theory and how comets can affect our entire solar system electromagnetically, and how that can dramatically affect our sun and therefore planet Earth. There is an increasing body of evidence that electromagnetic disturbance of our Sun is directly related to earthquakes, volcanism, and weather on our planet. 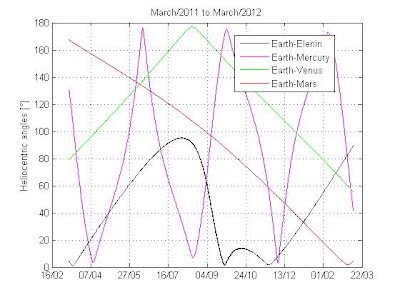 On the animation, there are two dots to represent Elenin’s position; one is from the February 4th elliptical orbital elements and the other is from the February 23rd elements. This is just to test the convergence of the calculations. On September 27th, there will be another Sun-Earth-Elenin alignment. 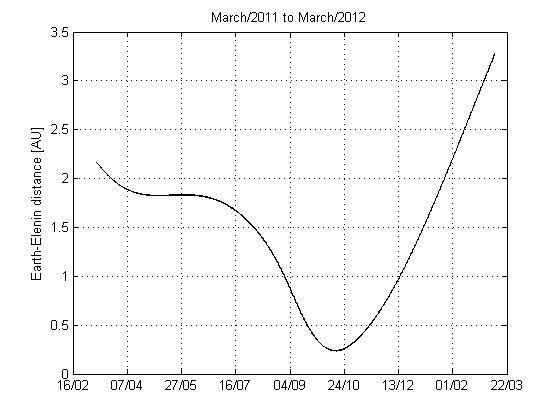 There will also be a new moon at this time (rather close) and this might produce more dramatic EM action on the planet. 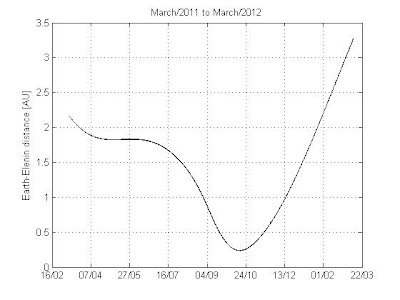 If you check the angles plotted on the graph below, you’ll see that this alignment is actually very interesting because Mercury also lines up on the opposite side of the Sun. 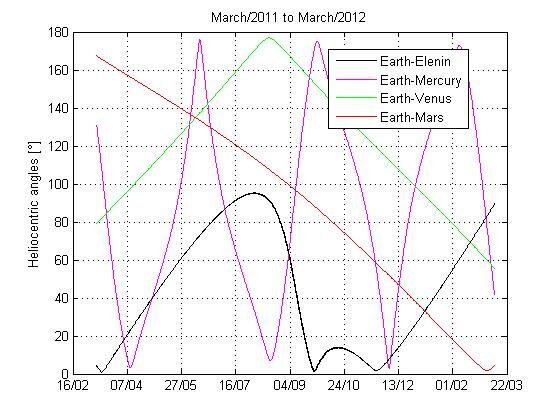 So it is really a Mercury-Sun-Elenin-Moon-Earth alignment. On November 23rd, another Sun-Earth-Elenin alignment. The new moon of November comes two days later on the 25th, so that might be “close enough for horseshoes” in the case of EM action. If there are going to be any discharge related events as described in McCanney’s theory, these dates may be important.